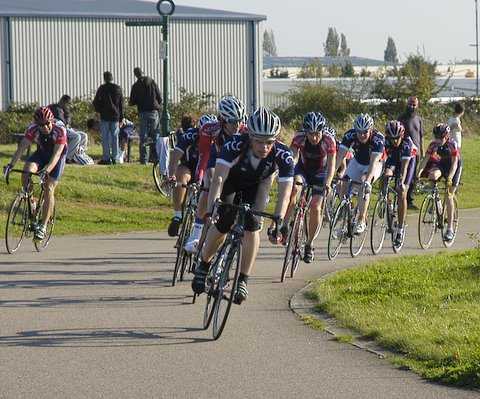 The 2008 club champs were held on a perfect autumn day at Hillingdon Race Circuit and true to Hillingdon form, it was windy where the rest of the country was be-calmed. 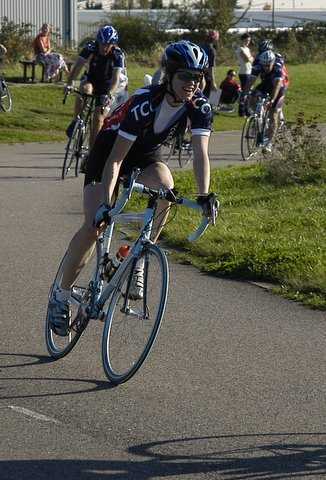 With a group of perhaps 30 riders this year, it was great to see so many decked out in club kit, with Kevin Butchart showing up in kit that is now close to 15 years old in design, but in TCC kit nonetheless. After some words from our exacting chairman and instructions to stay together for the first 20 minutes we headed into the race. Lisa west obviously not completely warmed up, stretched her legs but not actually trying to escape, she was counter-attacked by Josh Worrall , who had obviously not been listening as he opened up a gap of 45 seconds after just 3 laps. The commissaires were a statement in themselves by shrugging their shoulders unconvincingly so it caused the bunch to take some action. A few big turns from Andy Betts and Steve Home with some help from the rest of the main field, which had split into several groups due to the injection of pace. 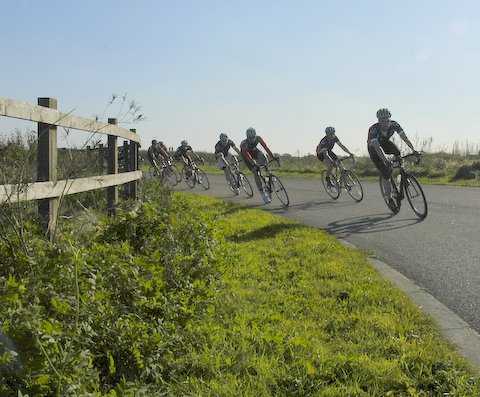 It was a 2 lap big effort from Andy Betts that brought Josh back in to the bunch and then it was a steady tempo to hold off any groups getting back on. With about 20 minutes to go Steve Home attacked into the breeze and although chased by Mssrs Worrall and Jack, the gap was just 50 metres too big and they swung up and joined the rest of the main field of 5. 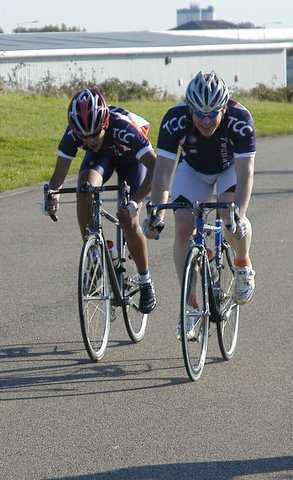 Then with 5 laps to go it was last years champion Andy Betts who cleared out with James Leach chasing hard. Betts hoping to make up the 40 second lead that Home had garnered. Meanwhile behind the battle for the vets title was un-folding with Josh Worrall and David Jack the only vets on the lead lap, Jack was practising the fine art of track sprinting by following Worrall’s wheel like it was 500 metres to go, only Worrall was none too happy about this tactic and slowed to walking pace, which gave the rest of the field a chance to get back on, including the leading Junior rider, Gavin Mitchell, who was in the second group on the road , a lap down. Further back again was the leading women rider, Nicki Drinkwater, who had stayed with the fast moving main field longer than her competition and she opened up a gap of almost a lap on her next rival. In much the same position was Rory Atkins, who had sustained the brunt of the attacks to open up a decent gap on his competition too and both he and Nicki Drinkwater would take their respective titles. 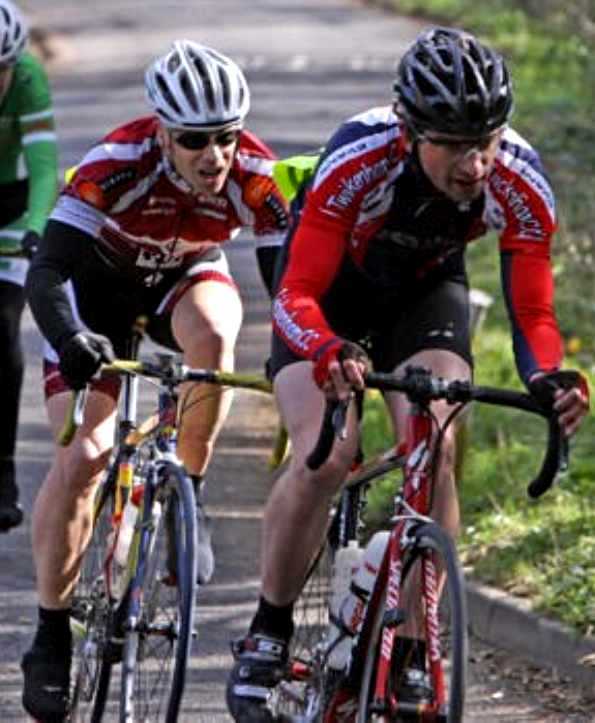 Back to the front of the field where Steve Home had consolidated his escape and took the Club Circuit Championship Senior title win comfortably 20 seconds ahead of Andy Betts with James Leach 3rd. The battle for 4th and also the vets title came down to a last lap dash, first from new rider Harry Sampson, who attacked on the bell, opening up a small gap on the bunch and as they hit the back straight head wind he was chased down by Jack and then the rest of the strung out field. Jack took the lead and kept the pace steady until the bottom of the climb, where he injected some real pace and with soon to be Junior champ Gavin Mitchell on his wheel, Jack wound it up for the line. Mitchell came close but the result would make no difference with him being a lap down on Jack but more importantly both Jack and Mitchell would take their respective vets and Junior titles. A full list of results will follow shortly but we can give you a confirmed top 7 and each category champion. Thanks to Ann and Mike for providing fabulous after match cakes and teas, plus Doug for helping with sign on and Dave P for his rousing on the line speech, which was perhaps brief but too the point….Go Twickenham!! See you at the Club dinner everyone.